The July 2016 issue of Trailer Life Magazine is featuring our article about what it takes for a One Ton Truck to be a true heavy duty towing machine. 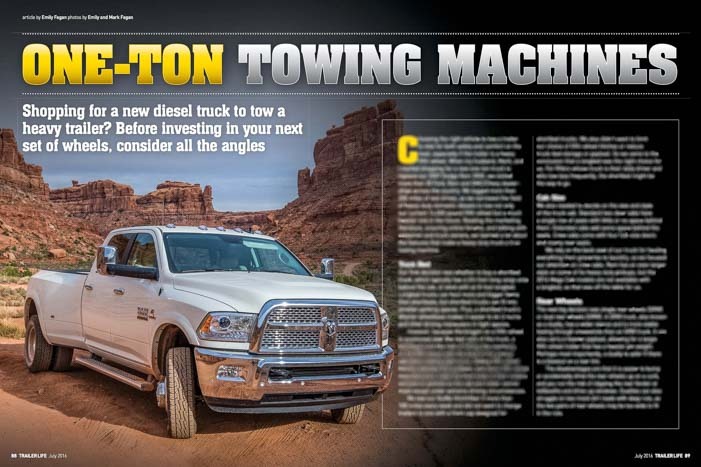 We are incredibly proud to have been asked to write this article about diesel trucks for Trailer Life, and especially that it appears in this month’s very special edition: Trailer Life’s 75th Anniversary Issue. Besides our 7 page article about selecting a diesel pickup truck for towing a heavy trailer, this issue looks back at 75 years of RV history and has some wonderful articles on the evolution of RVing. Trucks and trailers have gone through a huge evolution in the past 75 years! 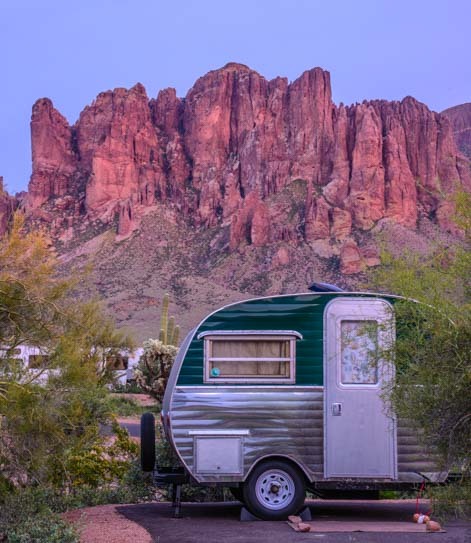 From the Bowlus Road Chief aluminum sided trailers that resembled an upside down boat and inspired the Airstream, to the Shasta trailers that my hubby Mark remembers from his boyhood camping days with his family, to the iconic Winnebago bread box motorhomes with the big “W” on the side that we still see people driving all over the country, this issue of Trailer Life takes us back in time. 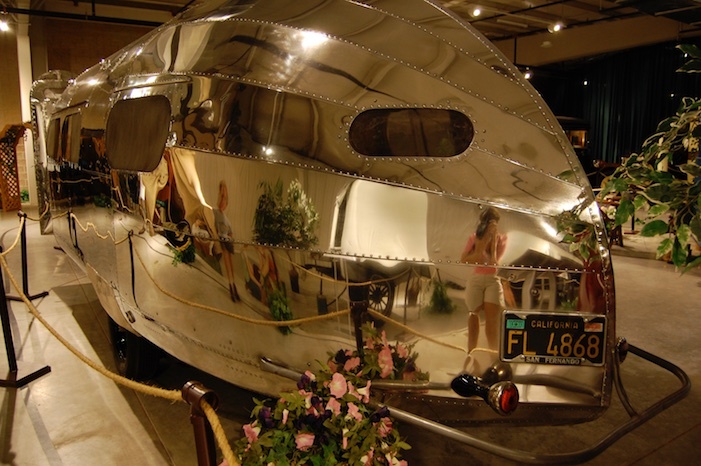 A 1937 Bowlus Road Chief — precursor to the Airstream Trailer! 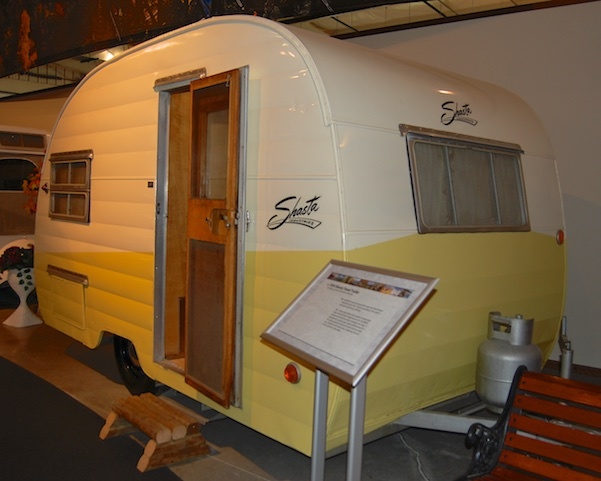 1954 Shasta Travel Trailer – Mark camped in one of these as a kid! In this issue, they also talk about the resurgence of interest in retro trailers — we see so many retro trailers on the road as we travel! — and they also have a biographical article about the “Godfather” of Trailer Life Magazine, Art Rouse. 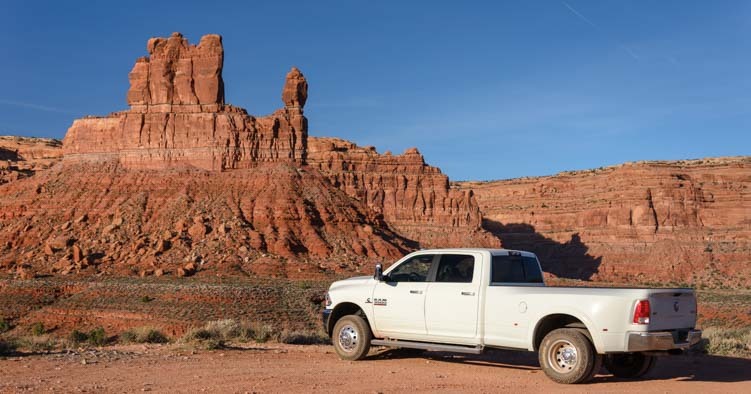 It is really exciting for our contribution about 2016 diesel trucks to be published this month right alongside such a fun and detailed retrospective look at the RV industry’s history. Americans — and the world — have taken to RV living in trailers and motorhomes with great gusto for many years. 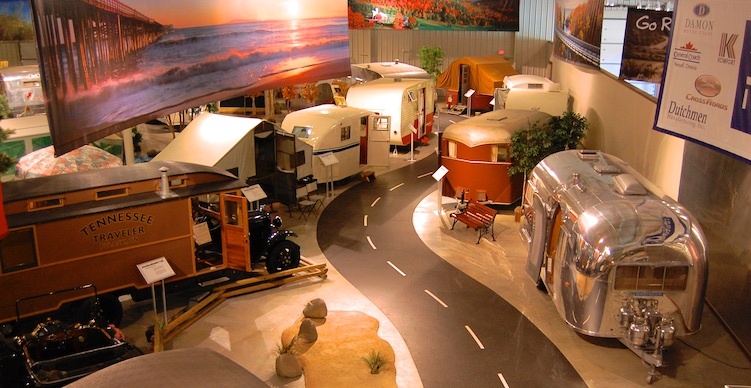 We first got a true feeling for this long history when we visited the RV/MH Hall of Fame Museum in the heart of the RV industry — Elkhart, Indiana — back when we traveled through that area in 2010. Besides being able to go into the museum library and peruse yellowed copies of Trailer Life, Escapees Magazine and Motorhome Magazine, as well as many others, from decades ago (the advertisements are hilarious and say so much about American culture in each era! ), we also took a walk back in time along their winding indoor “Road Back in Time” exhibit. This took us past and through small and classic RVs from every decade. Some of the craziest and earliest trailers of nearly 100 years ago were just a canvas tent on wheels (some even had wooden wheels!). 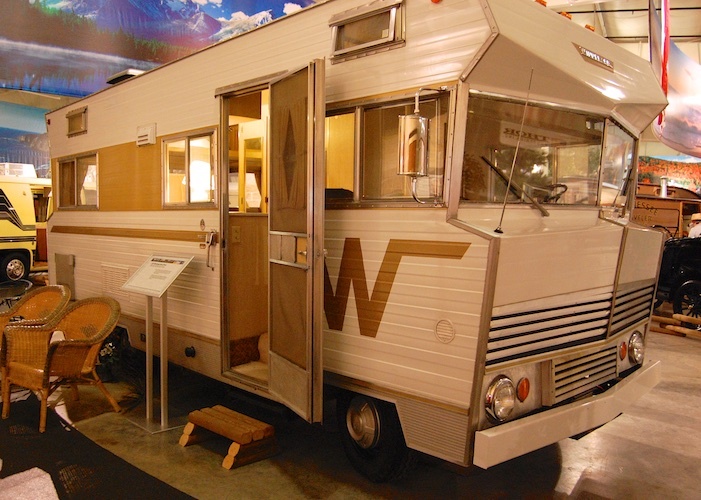 The museum also displays Mae West’s House Car and other exotics, as well as a few Shasta, Mallard and Coachmen trailers and Winnebago motorhomes from the 50’s to the 70’s. But the cool thing is to see these oldies-but-goodies out on the road and still in use as we travel, and to meet people who have bought brand new retro style trailers too. You can get the old fashioned look but have all brand new appliances with the latest technology. How fun! We had a chance to peek inside a brand new retro-style trailer in City of Rocks. NM – Wonderful! 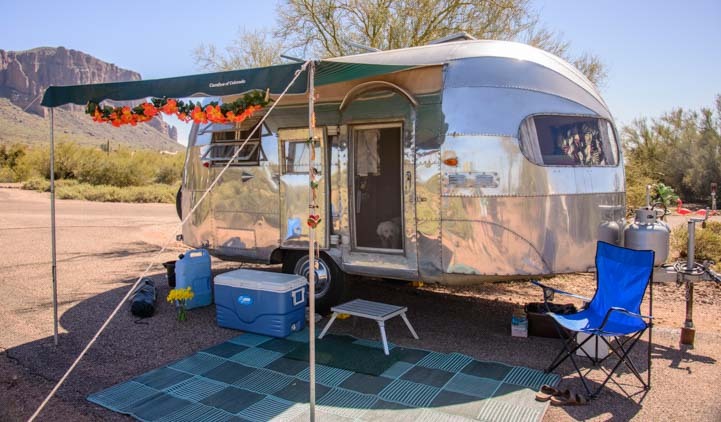 This fantastic retro trailer was pulled by a Honda Element… perfect! For anyone contemplating the RV life or currently enjoying it, Trailer Life Magazine fills a special educational and inspirational niche. It is available both as a glossy print magazine and in digital form online. 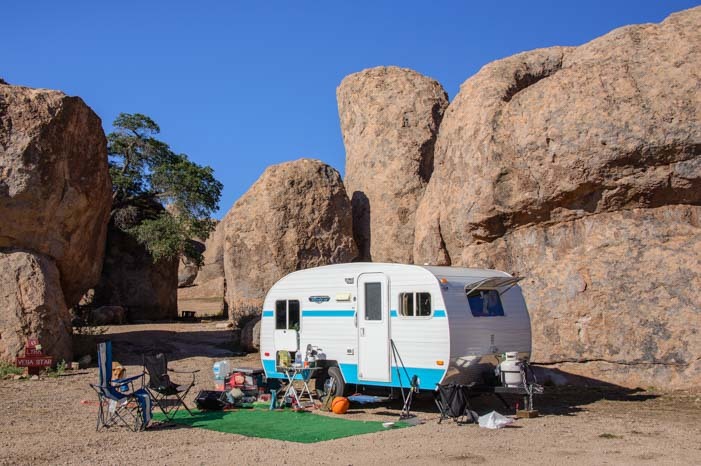 This entry was posted in The Full-time RVing & Cruising Lifestyles and tagged Full-time RV Lifestyle, New, News, Non-Travel, RV Tech Tips, RV Tech Tips Truck by Roads Less Traveled. Bookmark the permalink.